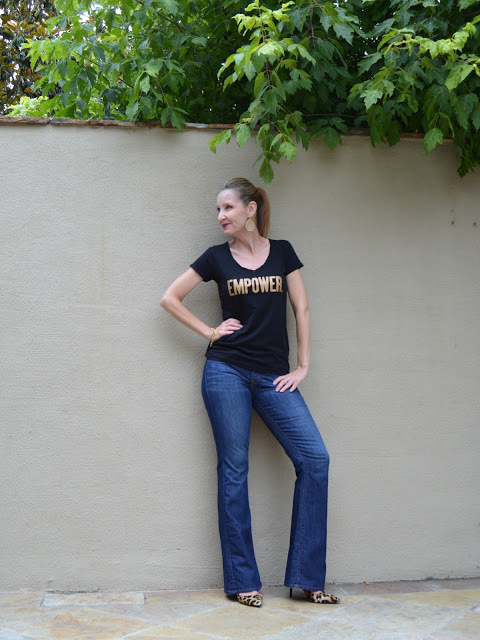 What does it mean to be empowered?! It’s a beautiful word, right? To me it means being able to channel your own personal power to work toward your dreams and goals. There’s a new brand that celebrates empowering women and empowering small business entrepreneurs. 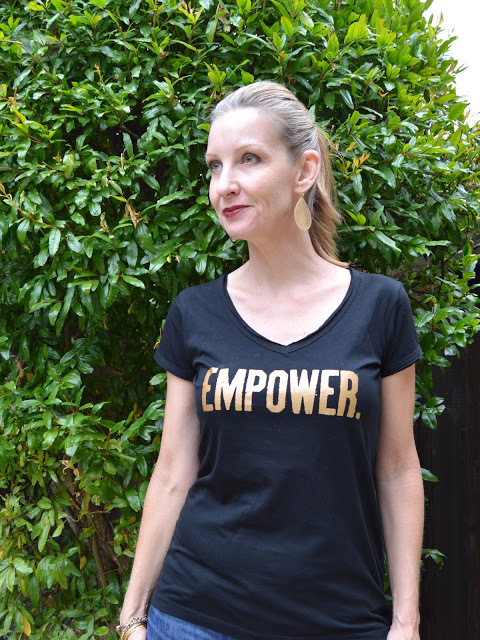 MLE Empowering Apparel is dedicated to helping you express your values in a fashionable way that will hopefully encourage sharing and discussion. The first time I wore this cool tee, I was walking down the street when I heard a banging on the window next to me. A women working out at the local gym was banging on the window to get my attention to give my tee a thumbs up. That was a fun way to start the day. Not only that, but MLE uses 10% of their profit to give micro-loans to small businesses in Africa. Not a handout, but empowering help. Read a few success stories here. And read about the two fabulous ladies behind MLE Empowering Apparel, Emily & Maud. Lisa of Peridot Skies looks casual cute and ready for a picnic. Erin of Happily Howards looks lovely in red and ready for a party. And Nora of Jacket Society looks ready for a day of lunch and shopping! Link up, link back, & have fun! Here’s to a holiday weekend for a lot of us! Definitely cool – EMPOWER! Such a powerful statement. You wear it well, Dawn. 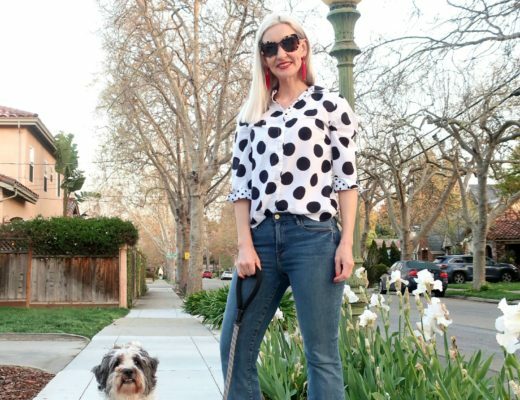 The tee, jeans and leo pumps show a women who's in charge of her destiny. LOVE IT!! Your sweet face Empowers me, you doll you!! Cheers and hugs for a fabulous holiday weekend!! Great tee with a great message! Well if you're going to have a message on your shirt—that's a fabulous one!! Great shoes to go with it—and doesn't 50 look spendiferous on you!! Empower is a beautiful word! I would have done the same thing when seeing you wear this tee shirt. Big thumbs up to you!!! 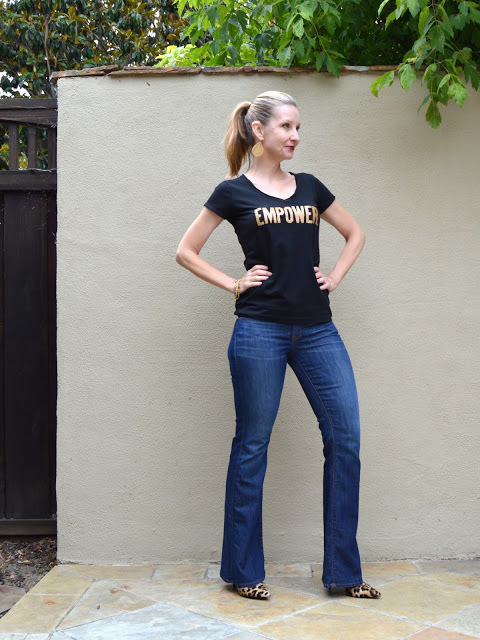 Will definitely check out MLE Empowering Apparel ~ who doesn't want to feel Empowered !! Of course you look fabulous and fierce! Thanks for hosting the linkup as always and look forward seeing you at our linkup parties. What a great tee and company mission! You styled it perfectly and look so chic! Have a wonderful 4th! Such a cute tee & love the message behind it! Have an amazing 4th of July weekend! Dawn Lucy, this is the second post I have read about this company and this tee! I am totally getting on board with this! How fabulous! Thanks for the link up as usual. And please stop by and link up with me as well. Have a magnificent weekend! Thanks for linking up, Dawn Lucy! I hope to see you again next week! It is a beautiful word and you always have such inspiring posts! Happy weekend! Nice message and tee. Have a lovely 4th of July and weekend! Love this post and the tee! Enjoy your weekend! I like a sturdy but still feminine outfit! Thank you for hosting. Hope to see you later today on Fancy Friday linkup! 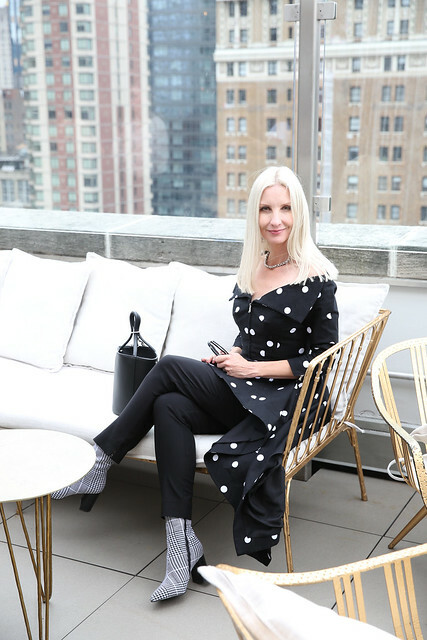 Thank you so much for the feature Dawn! Love that t shirt, looks fab on you. Happy 4th! Love this brand and what they stand for! Thanks for sharing. Looking strong and gorgeous as ever! Love a good graphic tee…and love it even more when it's rocking such a powerful message! That is such a great T-shirt – love the message and the mission of the company. Thank you for hosting! Very cool tee! Have a wonderful weekend! Great Tee. Love the leopard shoes with the look too my friend. I feel this way with my health. I have to take charge and empower myself to research, see docs I need to, and do what I can to feel better. Its a strong word and message! Good for you, Jess! Adore you! Your heels are perfect for this outfit!!!! Cute shirt and love the message. So simple but so powerful! 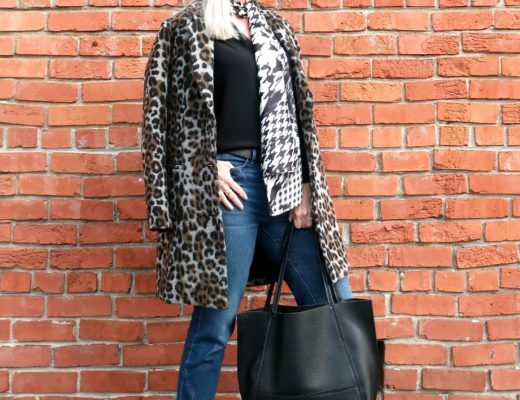 Love the way you styled it as well, with the jeans and leopard print shoes. 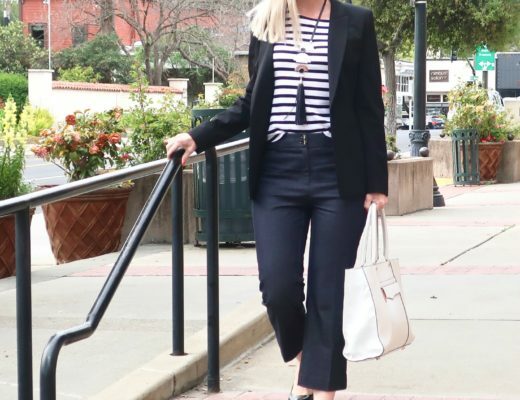 Thanks for linking up to #UntamedStyle this week! Love the tee and the story that goes with it! fantastic message and attitude. thank you for sharing your post on my Up Down All-Around link up. That is such an inspirational top and I think it is great that part of the proceeds goes to help people! 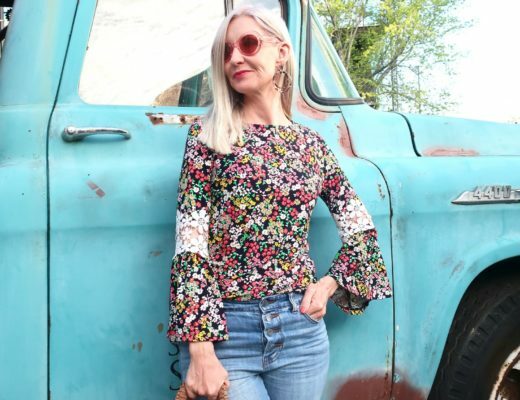 Such a great top, love that it's cute AND inspirational- good find! Wow, that top is inspiring. And pairing it with those flared jeans is just perfect! Love the tee! Very comfy look! Stunning! That graphic tee is too cute! Super cute tee! I love the message and the brand.